I can’t get enough of these fold-over maxi skirts. They are comfortable and easy to move around in, two things that are high on my list of clothing requirements right now! These aren’t going to be super detailed pattern creation instructions. I’ll give you the basics, but I don’t have the brain power to write up an entire lesson on how knit stretch affects your pattern measurements and fit. This skirt is simple and easy to adjust, so don’t get too worried about figuring out your exact fabric stretch vs. body measurement comparison. It’s an easy thing to fudge with this skirt construction! I honestly haven’t bothered to make up a paper pattern for this skirt, It’s simple to mark your measurements on the fabric and then cut, and since the measurements you use depend on the stretch of the fabric, you might otherwise need to tweak a paper pattern each time. For these skirts, I usually go for knit fabrics with a 60% stretch. I like the skirt to have a bit of stability and not too much drape. Don’t pick a fabric that is too stiff though. You still want it to flow when you walk! I also choose knits that aren’t too thin. Do I want you to know the color of underwear I have on? Not exactly. It’s really hard for me to write this and not get technical! Trust me, I had a whole handout, with body measurements, pattern measurements and knit stretch math planned, and then I realized I was NEVER going to get that done. Did I tell you we bought a house and are moving at the end of this month? Yeeeeeah. Things are a bit nuts over here at the moment! So let’s keep this fun and super easy, alright? 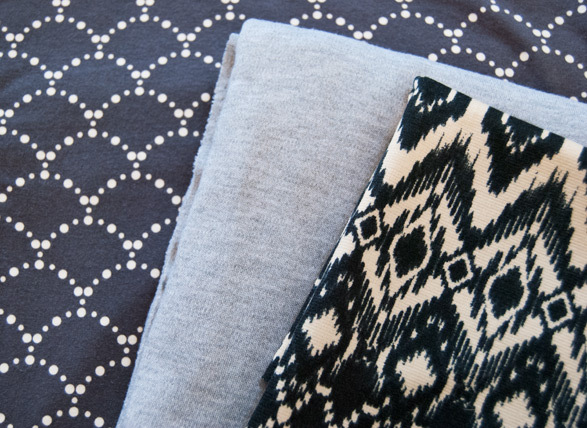 Go ahead and buy about 1.5- 2 yards of 60” wide fabric and matching thread. Definitely get 2 yards if you will be pattern matching, but for the most part, 1.5 yards will be plenty, unless you’re extra tall. Be sure to prewash it so that it won’t shrink later. The first thing you’ll need is your waist measurement. For the maternity version, take this measurement right under your belly, close to your hips. Make sure that the tape measure sits at an angle and is above your bum. If you are not pregnant, take this measurement at the lowest point you would want the skirt to sit. You are not taking this measurement at your natural waist. Where this measurement is taken, is where the seam between the fold-over waistband and skirt will sit. You could fold down the waistband to this point, or leave your waistband unfolded so that it sits higher. 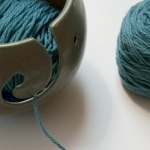 Next, take your knit fabric and fold over it in half and mark this measurement on it. You’ll want to see how it feels on your body before you go cutting anything! I pin it closed and try pulling the fabric over my hips once or twice. Does it feel too loose? You’ll likely have to remove at least 2” of fabric from the measurement to get a snug fit that won’t feel like it’s about to fall down. Make sure it’s not too snug on your hips. We won’t be flaring out the skirt that quickly, so if it’s tight on your bum now, it will probably still be fairly fitted over your rear once it’s sewn. Once you are comfortable with the fit, re-measure the fabric to see what you actually want your waist measurement to be. For my fabric, I subtracted 2 inches from my waist measurement. I’ve subtracted as much as 6” before from a very drapey rayon (this was pre-pregnancy), so don’t worry if you take away more than me! Just do whatever feels best to you. There will be that waistband seam where this measurement was taken, so you want it to be comfortable. You also want this measurement to be smaller than your hip circumference. You won’t want to wear a skirt that constantly slides down! The measurement I am using for my waist is 4 inches smaller than my hip circumference. Now! On to drawing out your pattern pieces! I recommend that you sketch them out on a piece of paper (or alright, go ahead and make a paper pattern if you are feeling motivated) so that you have all of your measurements on hand and ready to go. I enjoy having a 4” double fold waistband at the top of the skirt, but you may prefer 6”. You may want to play with your fabric to see how wide you want yours to be. This means that the pattern piece for the waistband is as wide as half of waist width, plus seam allowance, and is from 8-12” wide (since you will fold it over on itself prior to stitching it down), plus seam allowance. I have given you suggested skirt length and skirt circumference measurements on the image below. You will want to check and see if these measurements are long enough for your legs and wide enough for your stride. Also, consider the width of of your fabric. Depending on your waist/hip measurements, you may need to make a skirt that is a bit more straight and less flared, so it fits on your fabric. If you are a picky pants like me, you may want to create separate front and back pieces. To do this, subtract 1” total from your front pieces, and add this 1” to the back pattern pieces. 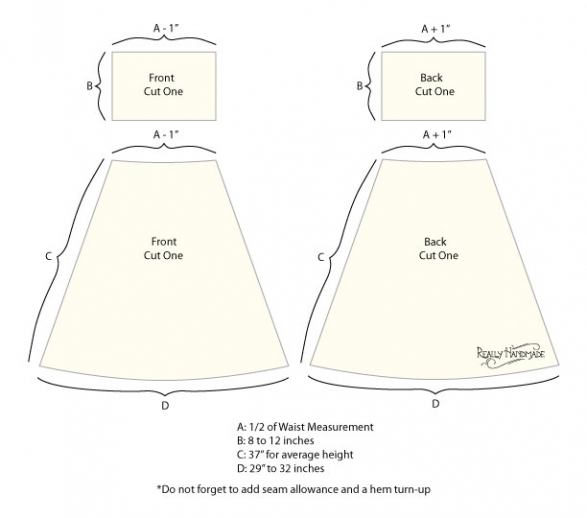 Double check all of your measurements to make sure you have added on seam allowance and a hem turn-up. 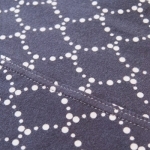 I use 1/4″ seam allowance because I sew this on the serger, and a 1″ hem turn up. Yes, I do have all of the measurements I like to use written down, as I am being lazy and not making pattern pieces for this skirt. I would never remember any of this otherwise! 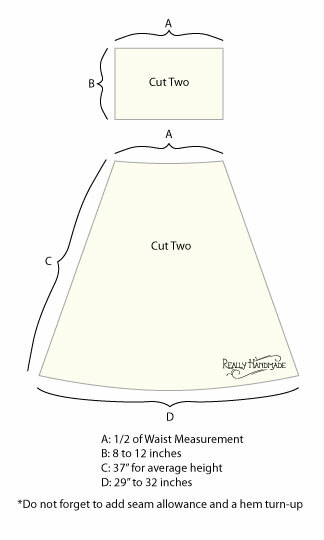 Once you have this done, you’ll be ready to mark, cut out and sew your pieces! 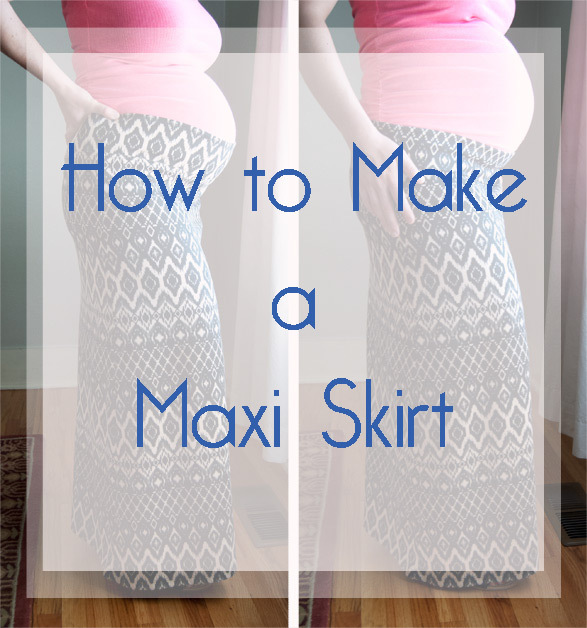 I’ll post the next part of the tutorial on marking, cutting and sewing the maxi skirts on Friday– Saturday– this coming week. Pregnancy fatigue hit me big time this weekend, so I’m hoping to publish it early next week. Update: Part 2 is now here! This entry was posted in How To Make, How to Sew, Patternmaking, Projects and tagged clothing, fabric, patterns, sewing, summer, tutorial on August 19, 2014 by Amy Alan. Thank YOU! 🙂 You can come over and make some with me when we’re in the new house! Or I’ll come crash your new studio, that works too. Haha- thanks! 😉 I’m a little scared to see how much bigger it’s going to get in the coming weeks! Geez! I don’t even know how you have the energy to write the post – forget the pattern! Bump looking beautiful btw! Congrats on the house…you are going to be busy! Enjoy…. My secret is taking a nap every day! Haha! No, really, I have to at this point. I wish I would have added up how long it took me to write this post. My brain can only form cohesive thoughts for about 2 hours every day, which really cuts down on how much I can get done! It’s stressful, but I’m trying to accept that that’s how it is and go with it. Super post! Thank you so much. What a beautiful belly you’ve got now… Much happiness! Thank you, Hélène! The belly is certainly growing a lot. 🙂 I’ll have some more pictures of it up soon! They are the BEST! I don’t know why I didn’t sew them up sooner! Nice and simple I hope it goes as well as it sounds! and good luck with the move! Thank you! Good luck with the skirt! 🙂 It really is very easy.